With an approximate total of 135 miles, the Cowal coast line offers plenty to explore. Taking in Loch Fyne, Kyles of Bute, Loch Ruel,Loch Riddon, Loch Striven, Firth of Clyde, Holy Loch, Loch Long and Loch Goil with the ever changing scenery. The route can be paddled either one section at a time or multiple sections. A moderate enjoyable paddle allowing time to explore and stop for breaks etc, not a mile munching time trial ! Each section starts/finishes close to a road so vehicle drop off and launch/up lift is easier. If desired on multiple sections, wild camping, campsite camping, a bunk house, a bothy and even hotels can be found en route. Some village stops are available ,offering the chance to stock up on provisions. Please see below listings for Accommodation, Eateries, General Stores for supplies and Points of Interest. Most of these are where your kayak would hardly need to leave your sight. -Out of the Blue Bistro/Post office. -Black Harbour. South of Otter Ferry. POI, Rocky Islands. Scenic. -Eilean Buidhe. POI. Most Westerly part of Cowal. -Ardlamont Point. POI. Most southerly point in Cowal. -Tighnabruaich, town. 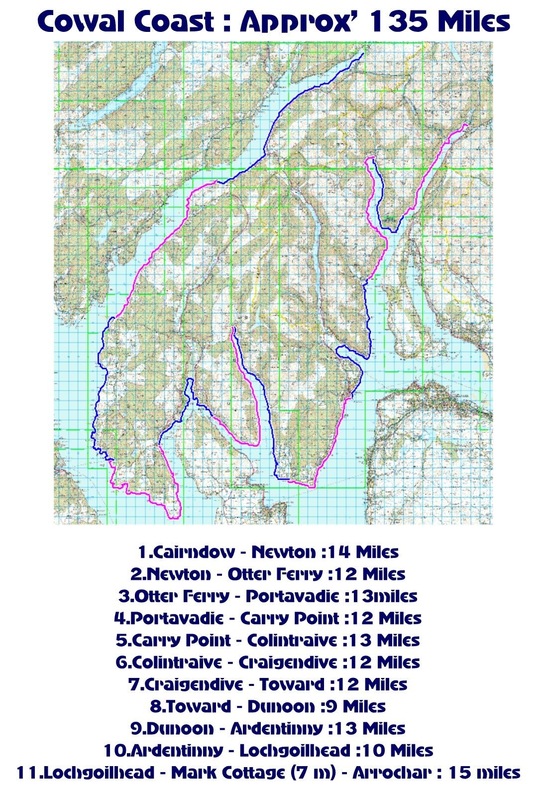 (RNLI slipway) access to…..
-Buttock Point,North Bute POI, Kayak stop. -Burnt Islands,Kyles of Bute. POI. Scenic, tidal race! -Innellan Slipway, North of Old Pier. Access to…. -Innellan Post Office and store. -West Bay, Dunoon. Beach. Access to…..
-Holy Loch Marina. Access to…..
-Also access to Sandbank Post Office. Groceries. ( main rd). -Ardentinny Hotel. Ardentinny. Food Accommodation. ( Closed for refurb). -Caravan Shop,Drimsynie Estate. Near Drimsynie House. Concrete Bridge. General Store. Off Licence. -Lochgoilhead Post Office. General Store. -Arrochar Village Shop. General Store.